Cut Corvina REX in small dices and fill the previously moistened pastry sheets with béchamel sauce and Corvina Rex dices. 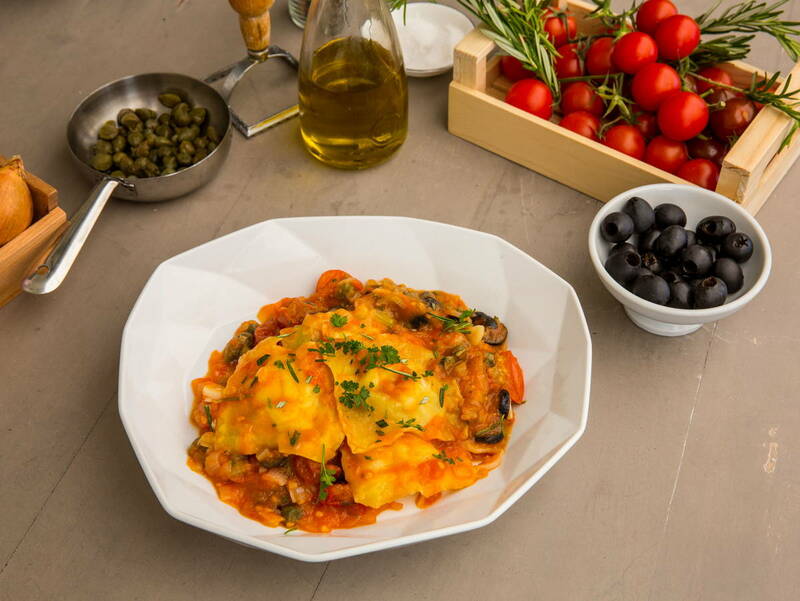 Season and cover the mix with a new pastry sheet and seal each ravioli. Slightly cook in a pan the previously sliced garlic and chopped onion. After a few minutes add the previously cut cherry tomatoes and the tomato purée. Slow cook for 20 minutes while slicing the olives and capers, which will be added to the mix. Add the chopped rosemary and parsley and season. Finally toss in the ravioli and slow cook all together for about 4 – 5 additional min, adding some water if needed. Serve and decorate with aromatic herbs.